This vintage 100% polyester jacket was originally purchased at J.C. Penney. 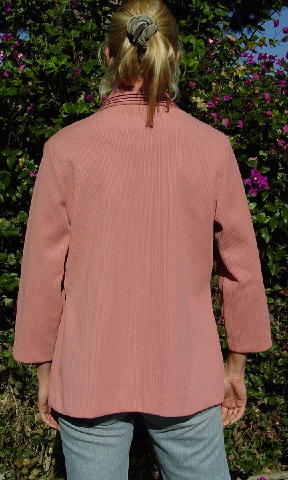 It's in a mauve-dusty rose color with three accent lines in burgundy which go around the collar and down both sides. The fabric has a ribbed texture to it. The tag says it's size 16, but it fits like a size 14. It's from a stylist's collection, and was used as background wardrobe in a movie. shoulder to end of sleeve 19 1/2"
shoulder to hem 25 1/2"